Ambassador Ronald Lindsay was commanded to hold a garden party for King George VI and Queen Elizabeth on 8 June 1939, followed the next day by a morning reception for British subjects, and then a dinner, all at the Washington Embassy. These were to be the Lindsays’s last, but by far their most public and important, official performances in Washington. Indeed, the Royal tea party has been the most significant event to take place there in the history of the Embassy. The importance and careful diplomatic negotiations of the visit—the first reigning monarchs of the United Kingdom to set foot in North America—have been examined by historians from many viewpoints, but little (with the exception of Tim Barrett) of Lady Lindsay’s and her Embassy garden’s role in it all. My feelings are very mixed. I was once again at the finishing tape, which is once again moved further away. I am tired, and strained and more than fed-up. I am appalled by the mere thought of what we must go through during the visit. I should collapse at the thought of what we must go through during the visit. I should collapse at the thought of the intervening winter, were it not that R. will go home for 2 months leave, and I can cut out much. And through it all there runs a purely sentimental relief that I shall once again see these surroundings in leaf (Letters, 12 November 1938). Royal prerogatives, diplomatic privileges, social glories, are out of date and I am out of sympathy with them all. But I am genuinely admiring of personal worth, which I think the present King and Queen typify. They do not inspire me, but they are perfect examples of a sense of duty, decency and sanity. Mildred Bliss of neighboring Dumbarton Oaks, veteran spouse of the American Foreign Service, immediately sensed what was in the offing. Lindsay replied to her: “Tread lightly, & save yourself wherever & however you can. Bless you for your offer for the Royal visit. We still know nothing in detail, but I feel sure we will gladly grab at the hand you extend” (20 November 1938). Lindsay was also dealing with the potential disaster of having the ceilings in the Ambassador’s Residence cave in, as the structure was essentially condemned while Sir Ronald and the staff of the Chancery were all away after Christmas. If the State function in honor of the British rulers is to be held in the spacious gardens already famous for Lindsay parties, it is particularly fitting that Lady Lindsay should be hostess. The gardens have always been her special interest. Her profession of landscape gardener and architect, which she followed as Elizabeth Sherman Hoyt before her marriage, has expressed itself since she came to Washington in making the embassy grounds one of the show spots of the capital. She spends several hours each morning in the gardens (23 April 1939). Along the way, New York’s fun-loving and publicity-shy Elizabeth Hoyt acquired a garden trowel and an English title. Now, the British King and Queen will entertain in the garden she made from a red clay hillside with the help of her trowel … The massive British Embassy was new when Sir Ronald brought Lady Lindsay here in March, 1930. Its grounds bore the marks of excavations. Although Lady Lindsay did not design the extensive gardens where Americans will meet the King and Queen, she replanted them entirely. Two factors influenced her garden plans, she said. She wanted the garden to be effective as many months of the year as possible and wanted to keep down the cost of upkeep. The onetime landscape architect visited other gardens in making plans. Then she put on old gloves and went to work herself. Now the garden abounds in trees, flowering shrubs, bulbs and the roses which she loves. It was initially determined that approximately 1,300 were to be chosen to attend the Royal garden party. The invitations went out in May and out came the social anxieties of Washington. A furor soon erupted in the press from those excluded from what was largely seen as the social event of the century (of the last King’s birthday garden party, the Washington Post stated “Great prestige is attached by social Washington to an [any] invitation from His Majesty’s Embassy,” 5 June 1939). As the gatekeeper of those invitations, Lindsay became the target of many unhappy reporters, particularly from the women journalists who had previously covered her with fawning portraits, not to mention Senate wives; her profiles turned, with adjectives “regal” and “aloof” suddenly appearing, and snide emphasis on her being wealthy and American-born. Tension over the media coverage grew between British and American officials, with Lady Lindsay at the center over her handling of the party. Viscount Rothermere’s Daily Mail printed a long dispatch from its Washington correspondent that reported that American newspapers were angry at the “snobbery” and “tactlessness” of the Lindsays. She appeared to approach the planning with a sense of dreaded duty, “like walking on egg-shells,” as she said, but also with her typical efficiency. With all the vitriol aimed her way, Lindsay remained publicly—and diplomatically—silent. As she explained to her friend Olivia James, “Realizing in advance that there would be a storm of criticism over invitations to the Royal Garden Party, and fearing resentment against this country in England if the British Ambassador and the British Embassy were too bitterly attacked, I decided to deliberately put my own neck out for the blows.” To Isabella Greenway: “For the past 48 hours I have been subjected to personal attacks in what you and I would call the yellow Press of America, and I confess I quiver under it … What has now happened is that the baby has been put in our lap and that we are pulling other people’s chestnuts out of the fire” (18 May 1939). The complaints were more than mere social-class whining with a world war about to break out, if more than slightly hypocritical given the wide-spread American First sentiments among many critics. 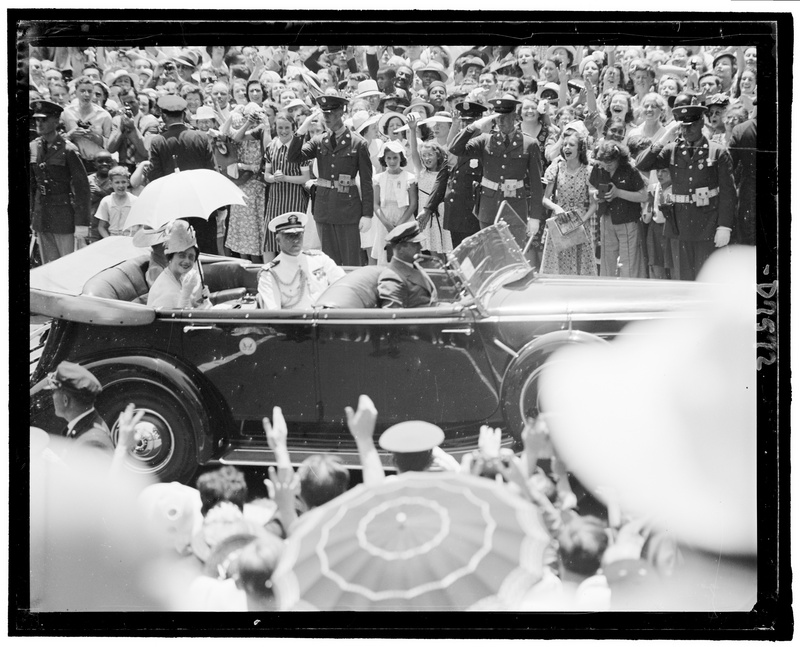 The Royal tour was a critical component of building American good will as part of a crucial war alliance. The British Foreign Office was concerned about how the trip would be interpreted in press coverage and public opinion. This was less than three months before Germany’s invasion of Poland. There were many isolationists on Capitol Hill suspicious of the Royal display of Anglo-American solidarity with the impending war, believing that President Roosevelt (who had invited the King and Queen to the United States from their Canadian tour) was trying to influence voting on upcoming legislation (the Bloom bill, which would give broader powers to the president to provide arms and ammunition). Even the Roosevelt’s and Lindsay’s old friend, Congresswoman Greenway, hoped to keep the United States out of the coming war, going so far as to oppose the President’s candidacy for a third term. After initially selecting only a small group from Capitol Hill, Lindsay relented under heavy pressure. With the aid of the conservative isolationist from Texas, Vice President John Garner (“Cactus Jack”, who happened to be a tennis partner of the avid player Sir Ronald), she expanded the invitation list to include all the Senate and their wives. The uproar in the press, inevitably, began to settle. It appears from personal correspondence that Mildred Bliss maneuvered a columnist at the Baltimore Sun to write an opinion piece defending Lady Lindsay’s predicament (2 June 1939). The much-anticipated day proved to be a very hot one. It was reported that the roses were not in bloom: “To Lady Lindsay’s regret the flowers were enjoying ten days of rest between bloomings” (“F.D.R. drinks toast to King”, Chicago Daily Tribune, 9 June 1939). There were plenty of flowers, though, with urns placed along the paths and portico that were filled with Canterbury bells, peonies, roses, and delphiniums. The table where the King and Queen had their tea was set with low silver bowls of pink roses and blue delphiniums. 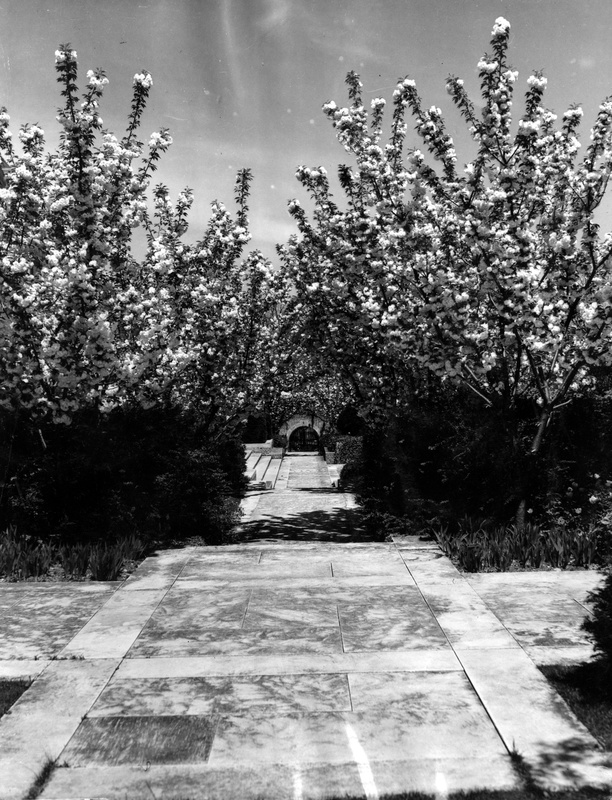 Since the greenhouses of the estate of Dumbarton Oaks regularly sent over flowers to the British Embassy (the greenhouses there were yet to be built), it is tempting to surmise that Mildred Bliss provided the extra blooms. A red-coated, pith-helmeted Exeter band stood under Lindsay’s beloved cherry trees of the terrace to play. 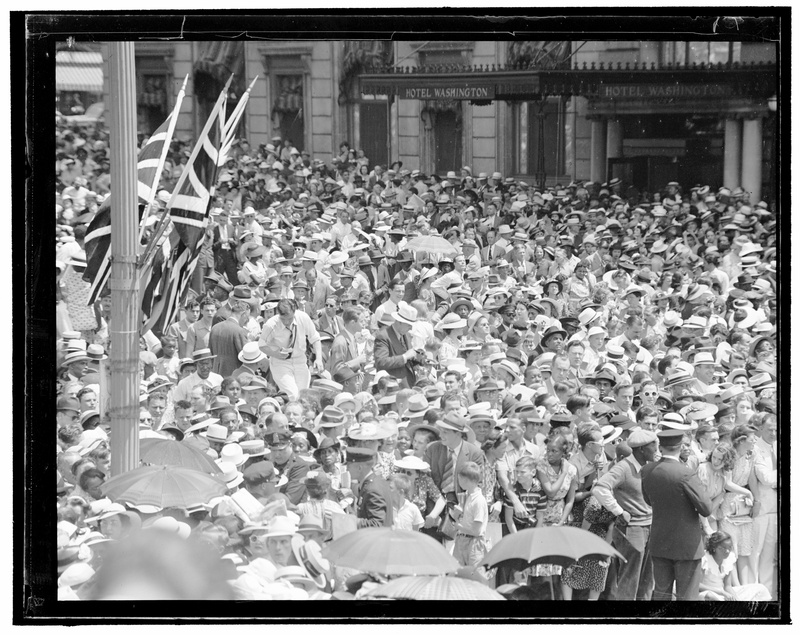 The garden party as well as the entire trip was seen as a theatrical success, with the King and Queen playing their roles as deferring sovereigns, honoring Americans. The Royal couple charmed their way through a visit to Congress. 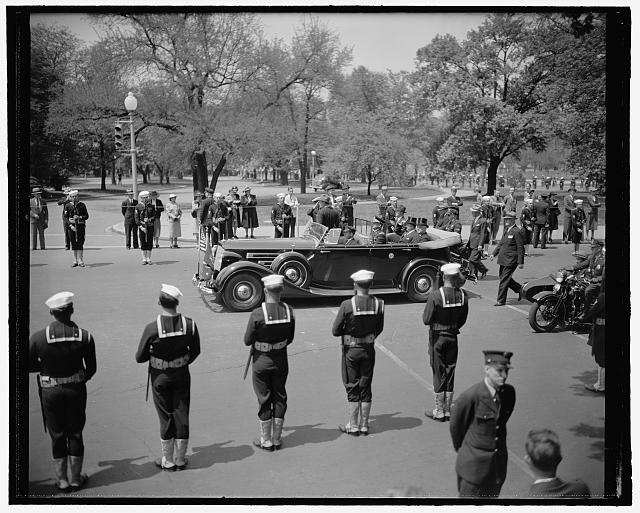 Despite stifling heat, a reported 600,000 lined Constitution Avenue to catch a glimpse of their motorcade; although not an official holiday, work stopped in the city. 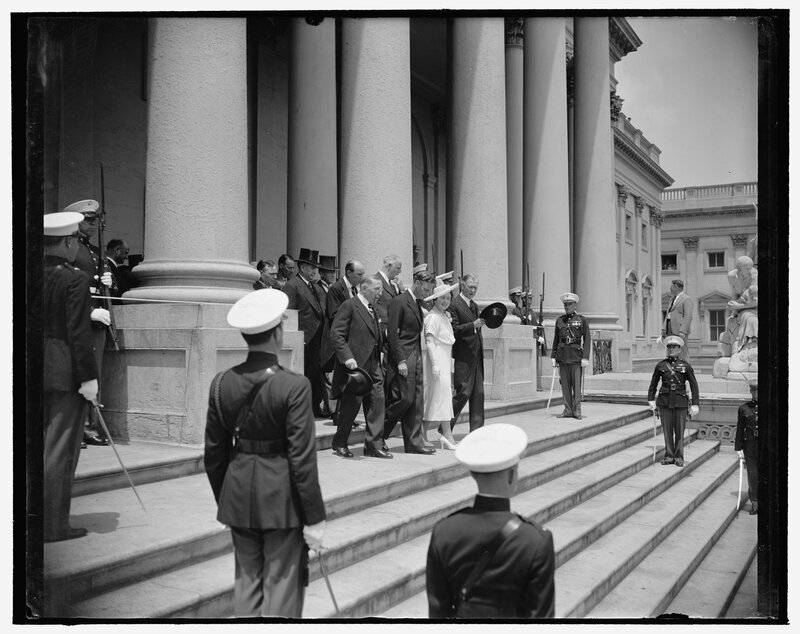 In addition to Capitol Hill and the White House, there were visits to Mount Vernon, the Civilian Conservation Corps at Fort Hunt, and Arlington Cemetery, where the King laid a wreath at the Tomb of the Unknown Soldier. 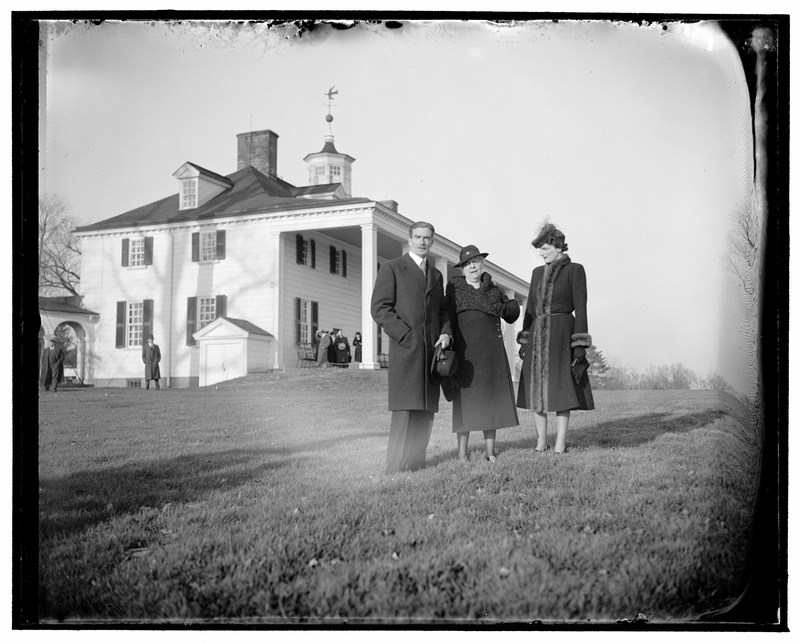 Following the hectic two days in Washington, the Lindsays were part of the Royal entourage visiting the World’s Fair and then the Roosevelts’s Hyde Park home in New York. The Roosevelts famously served the Royals hot dogs and beer at the Hyde Park picnic, transitioning from the formalities of the State Visit in Washington to the informality of the New York home, illustrating the Royals’ enjoyment of simpler American life to the public. At the British Embassy it was, of course (and had to be) a different, more formal affair and was finely balanced between American style and British traditions. Sir Ronald was able to report to the Foreign Office (12 June) that it was all “a complete success” with “no incident of an unfortunate note.” The American public enthusiasm for the Royals was “unprecedented.” The press accounts were rapturous. The increasingly famous and sought-after Embassy parties, a useful tool for rewarding friends of Britain in Washington and cultivating their critics, reached their height with the Royal garden tea. Lindsay, in her crucial roles as creator of gardens symbolic of Great Britain in America and as gate-keeper to the party (and an American one at that) helped take a lot of the political pressure off of Sir Ronald, even if at her own expense. Essentially a private woman, her reputation did not recover, and the controversy set her legacy. A newspaper report of Ambassador and Lady Halifax’s arrival in 1941, while giving Lady Lindsay full credit for being “an expert landscape gardener and translated the once barren ground surrounding one of Washington’s most elaborate dwellings into a proper setting,” nevertheless added that “Neighbors who had the temerity to brave the Lindsay look used to call up the Embassy to inquire incredulously how it’s possible to have forced forsythia so early” (Ottawa Citizen 25 January 1941). In fact, Lindsay had sent coveted invitations to the Royal garden party to all the surrounding neighbors. The Garden party given June 9 [sic], 1939, by the British Ambassador and Lady Lindsay in Washington during the visit of King George VI and Queen Elizabeth was a lovely sight to behold. The Embassy garden, entirely the product of Lady Lindsay’s horticultural knowledge and her devoted care, was at its peak of flowering beauty … Lady Lindsay, wife of the British Ambassador in Washington, is American born. She is, in fact, a grandniece of General William Tecumseh Sherman, he of the famous three-word essay on the nature of war. The Queen wrote to Princess Elizabeth from Hyde Park (11 June 1939): “We had two burning, boiling, sweltering, humid furnace-like days in Washington, and as we were busy from early morning till late, you can imagine what we felt like at the end of it! But everybody as so kind & welcoming, & one feels really at home here.” Shawcross, William, editor. Counting one’s blessings: the selected letters of Queen Elizabeth the Queen Mother (New York: Farrar, Straus and Giroux, 2012), p. 272. More on the entire U.S. visit is available online here. Barrett, Tim. “A Long Island Yankee in King George’s court: Elizabeth Sherman Lindsay and the 1939 British Royal visit to the United States.” Long Island Historical Journal, Fall 2003/Spring 2004, vol. 16, nos. 1-2, p. 112-134. Bell, Peter. “The Foreign Office and the 1939 Royal Visit to America: Courting the USA in an Era of Isolationism”, Journal of Contemporary History 37/4 (2002), p. 614. Greenway Papers, MS 311 F1826 Correspondence, 1938-39. Arizona Historical Society. Lombard, Helen. Washington waltz: diplomatic people and policies. New York: Alfred A. Knopf, 1941. Differs markedly in character from both parents. Is not a Rambler, but will ramble with support. 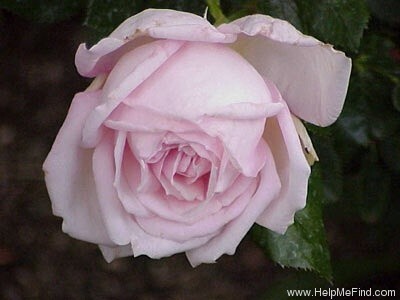 Adaptable to various uses, although essentially a garden rose. By due care in training and pruning many things can be done with it. No climbing shots have yet been observed. While pink predominates (?) there is yellow in it, producing a lustrous effect. Resistance to disease, and almost continually in bloom for eight months. Is nearly evergreen in Washington. Moderate fragrance in varying degree.